It’s a bit weird starting a new blog with a bunch of salads, but posting another cupcake or pasta recipe didn’t really work for me since I like neither so I figured “greens” is the way to go. However, don’t get confused because I am not vegetarian, so expect some really greasy stuff later on. Anyway, I really hate these introductions so I’ll just jump in. Spinach and Mango Salad, who would have thought but the combination with the hot sauce really works. No step by step pictures here, chopping greens is not rocket science so I’ll just post the recipe. In a small bowl whisk to combine green onion, vinegar, jalapeño, sesame oil, lime juice, sugar (agave), salt and pepper to taste. Cover and refrigerate for at least 30 minutes. 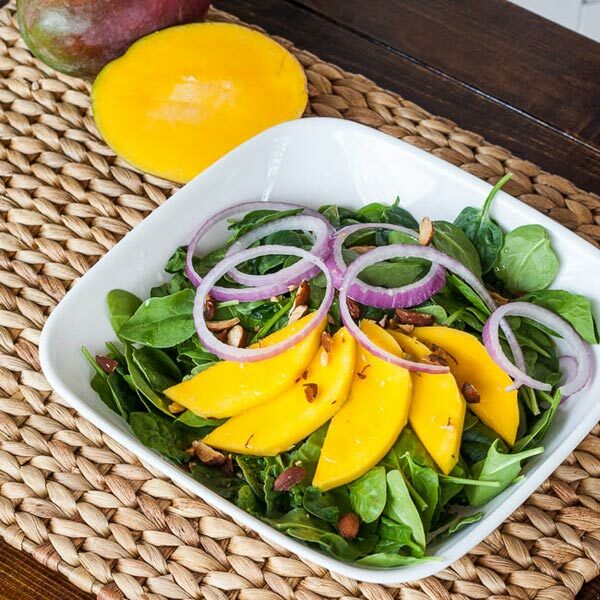 Place spinach leaves on 4 salad plates and arrange mango and red onion evenly on top of it. Sprinkle almonds on each salad. Whisk dressing and pour into a small saucepan. Place over medium heat and cook just until heated. Spoon warm dressing over salads and enjoy. OMG. I just made this and it was unbelievable. Paired beautifully with BBQ steak. I knoooow! I loved it myself though I was a bit skeptic at first about the mango and spinach combo.